So far, the labour market has not received any special attention from macro-econometric model builders. In this article an attempt has been made to describe the labour market in detail, paying attention to such important phenomena as the friction between labour supply and demand, the heterogeneity of labour, the dependence of labour supply on the labour-market situation, the Phillips mechanism and the impact of real wages on labour demand. To make it suitable for policy simulations, the model has been extended to a complete macro-econometric model, taking account of the fact that both labour and capital limit the production possibilities. 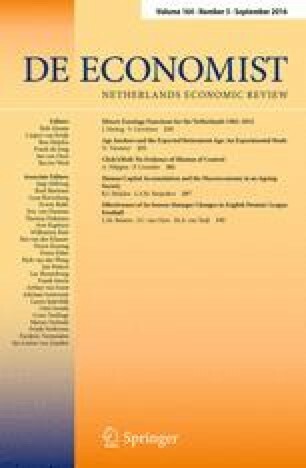 This paper summarises an extensive Dutch report on the construction of a model for the Netherlands labour market. The title of the original report is ‘AMO-K: Een arbeidsmarktmodel met twee categorieën arbeid; (AMO-K, A labour-market model with two categories of labour) ; it was published by the Netherlands Economic Institute (NEI) in Rotterdam in the so-called Olive Series, 1982-2, pp. 403ff. Some details of the model presented in that report were changed after its publication; see G. den Broeder, AMO-K 81-12, Tussenrapport betreffende de verdere ontwikkeling van het arbeidsmarktmodel (Interim report on the further development of the labourmarket model), Rotterdam, September 1983. Since then, only minor changes have been carried through. The model reproduced in this paper is the modified version. The model was developed within the National Programme of Labour-Market Research (NPAO) (now defunct), the NPAO organisation having granted a commission to the NEI in Rotterdam.